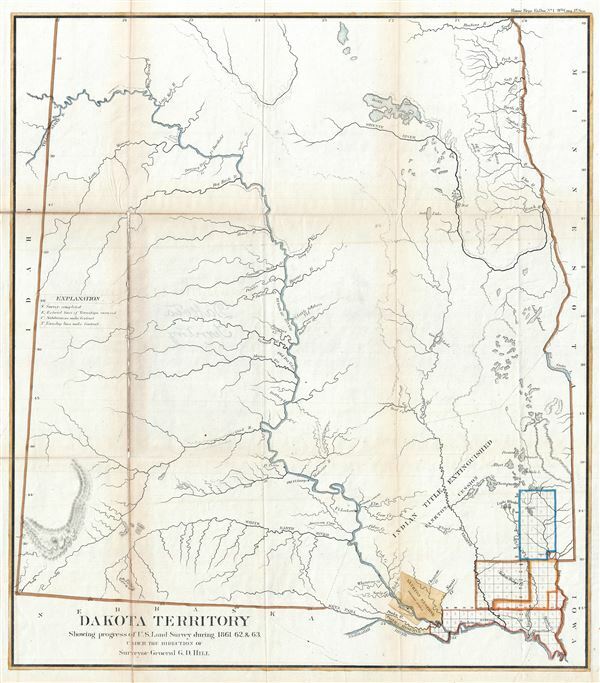 Dakota Territory Showing progress of U.S. Land Survey during 1861, 62 and 63. This is a fine 1863 public survey map of North Dakota and South Dakota (Dakota Territory). It covers the states of North Dakota and South Dakota before they were admitted to the Union. The map was prepared to illustrate the progress of the land survey work in the region during 1861, 1862 and 1863. Most of the survey work is limited to the land north of the Niobrarah (Niobrara) River in the southeastern portion of South Dakota, noted via a series of blocks representing the survey grid. An explanation near the left margin describes the various markings in the blocks. The map identifies the area of the Yankton Cession, the Yangton Reservation and the Ponka Reservation. Old Fort George, Fort Lookout and other forts are noted. The map also notes important rivers, creeks, towns and other topography throughout. This map was prepared under the direction of G.D. Hill, Surveyor General, and issued as part of the 1864 congressional report, Message of the President of the United States to the Two Houses of Congress at the Commencement of the First Session of the Thirty-Eighth Congress. Government Printing Office, Message of the President of the United States to the Two Houses of Congress at the Commencement of the First Session of the Thirty-Eighth Congress, (Washington) 1864. Very good. Some wear and toning along original fold lines. Professionally flattened and backed with archival tissue.